NASHUA, N.H. -- A former intern to Mitt Romney publicly stated on Monday that as a candidate for governor in 2002, the Massachusetts Republican did authorize and disseminate fliers championing equal rights for gay citizens. The statement, made by the Manhattan Institute's Josh Barro to Buzzfeed, directly contradicts what Romney's top spokesman Eric Ferhnstrom told The Huffington Post on Sunday. Barro, who served as an intern on Romney's gubernatorial campaign, explained that on Pride weekend in 2002, the campaign sent about a half-dozen interns to a "post-parade festival on Boston Common" to hand out flyers proclaiming that "all citizens deserve equal rights, regardless of their sexual preference." "The thing was organized by a full-time staffer," Barro added. Ferhnstrom, who served as communications director on that same campaign, told The Huffington Post on Sunday that the Romney's election team had not been involved in producing or handing out the flyers and that the former Massachusetts governor shouldn't be held accountable for them. "I don't know where those pink flyers came from. I was the communications director on the 2002 campaign. I don't know who distributed them ... I never saw them and I was the communications director," Ferhnstrom said. An email to Ferhnstrom on Monday, asking for reaction to Barro's recollection, was not immediately returned. The conflicting accounts renew questions as to just how much an evolution Romney has had on the topic of gay rights. Ferhnstrom insisted on Sunday that there had been "no evolution," that Romney has always been opposed to gay marriage and civil unions, while he is inclined to extend some legal benefits to gay couples. 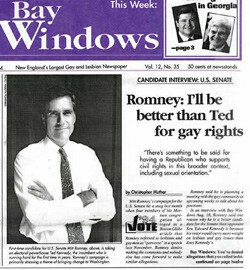 But on Monday, Buzzfeed also turned up an old 1994 newspaper cover, featuring then Senate-candidate Romney claiming that he would "be better than Ted [Kennedy] for gay rights." In disavowing the 2002 flyer, Romney's campaign has managed to open itself up to an attack by the reelection campaign of President Barack Obama, which questioned Romney's rejection of the flyers' language. "After Mitt Romney claimed he'd be a stronger advocate for gay rights than Senator Kennedy when he was running for office in Massachusetts, and one day after saying that gays should have 'full rights,' Romney's campaign today disavowed a flyer that simply said 'all citizens deserve equal rights, regardless of their sexual preference,'" emailed Ben LaBolt, the Obama campaign's press secretary. "What on that flyer does Mitt Romney disagree with? Does he not believe all Americans should have equal rights? Who is he trying to pander to now? This is why Americans will have trouble trusting Mitt Romney -- he doesn't keep his word."